King of Kings (biggest blue sign) next to Chung Yuen Electrical (red sign under the blue Sony sign) on Des Voeux Road Central in the 1960s. Earlier on the website we have covered several prominent ice cream manufacturers from the past such as On Lok Yuen, Finland and Yan Chim Kee. Another big name in ice cream from the past is King of Kings which was also known for its Chinese dried sausages (臘腸) and other cured meat (臘味). The two unrelated food products were actually a perfect match as they have highly complementary seasonal demand patterns (ice cream being popular in the summer and not so in the winter while cured meat being the exact opposite), allowing King of Kings to maximize its profits all year round. One of the current major Chinese restaurant chains King of the King have the exact same Chinese name but there are no known connections to the firm being discussed in this article (the surnames of the proprietors of the two are both Tse but unclear if they are relatives), which traced its roots to 1940s Canton and became a household name in HK in the 1950s and 1960s under the leadership of its second-generation leader Tse Hing-chuen (謝興銓). The name “King of Kings” has nothing to do with Christianity (unlike the Cheungs of ice cream rival On Lok Yuen, the Tses are not religious) but a sibling rivalry in the cured meat business in Canton which launched the firm. The siblings were Tse Pak (謝柏) and his younger brother Tse Cheong (謝昌), who came from Koyiu (高要) in western Guangdong province and both started out as street peddlers in Canton. 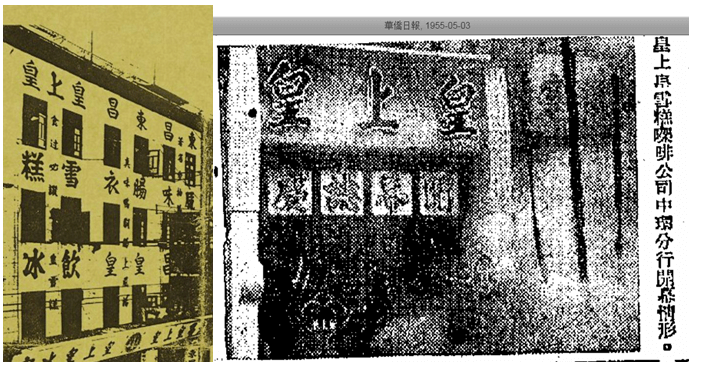 In 1937, Tse Pak opened a small shop by the name of “8 Centuries King Father” (八百載太上皇) on Haizhu South Road (海珠南路) in Canton selling congee, Chinese herbal tea and other goods but business was struggling in its first year or two. At the suggestion of a friend, Tse switched to Cantonese style cured meat in 1939 and business started to take off. At first, Tse Cheong made soap out of the excess fat from his brother’s meat shop and peddled them on the streets. In 1940, Tse Cheong opened a rival cured meat shop nearby under the name of Tung Cheong (東昌) in attempt to emulate his brother’s success. At the time, there were many butcher shops and cured meat stores in Canton (with Chong Chow 滄州, founded in 1903 being the oldest) so to stand out from the competition, the Tse brothers came up with many tactics. In the beginning, Tse Pak was more successful thanks to his product variety and brilliant store display. To catch up, Tse Cheong decided not to compete on price but to outdo his brother and other competitors on product and promotion. For product, he chose the best ingredients to make his cured meat – using the best meat, the best Chinese wine and even making his own soya sauce and personally supervised production. When cured meat were off season (which was two third of the time), he made soap and sold barbecued meat. For promotion, he poached one of his brother’s top lieutenants, expanded his store and built an innovative storefront featuring production line on the left, cured meat and sausages in the center and other goods on the right. Soon Tung Cheong was the talk of the town and like Thomas Watson who came up with the name International Business Machine (IBM) to trump his former employer National Cash Register (NCR), Tse Cheong added the name “King of Kings” to his store (hence became 東昌皇上皇) in 1943 to outdo his brother’s “King Father”. Aside from store display, Tse Cheong also invested heavily in other forms of innovative promotion. He advertised in newspapers and radio with catchy taglines and had cars with neon display drove around town to promote the King of Kings brand. He sponsored the curtain of the popular Hai Chu theatre so theatre goers saw the name of “King of Kings” before even watching their shows and handed out free “King of Kings” shirts to turn customers into moving billboards (very common now but very novel at the time). At year end, customers who bought a catty of cured meat received free “King of Kings” calendars. With heavy promotion, the King of Kings brand was firmly established. 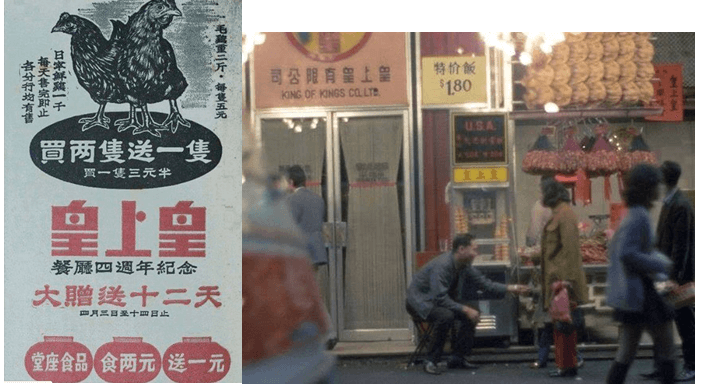 Left: King of Kings ad promoting its 4th anniversary sale in HK where customers received 1 free chicken for every 2 chickens purchased and $1 bonus for every $2 spent at the restaurant; Right: front entrance of a King of Kings restaurant in HK with cured meat on display on the right. When the War was over, King of Kings began a series of expansion. Inspired by the success of ice cream parlors such as “Canada” and looking for products to sell in the off seasons, it added ice cream to its range of products in 1945, which quickly became 60% of the firm’s profits. It opened a branch in Sai Kwan the same year and a third branch was opened on Tai Ping South Road in Canton the next year (1946). By 1949, King of Kings had three stores each selling 500-600 catties of meat per day (compare to 100 catties per day at its original store at inception) with three production facilities and 15 properties in Canton, making it the undisputed “king of the kings” in the Canton cured meat business. In 1948, a branch of the King of Kings was added in Macau and after the Communists took over Canton in 1949, Tse Cheong and his son Tse Hing-chuen (b. 1927) moved to Hong Kong where they opened their first King of Kings restaurant at 158 Wellington Street in Central in 1950 with a memorable ad campaign shown above. In 1953, King of Kings relocated to 652 Nathan Road and started offering ice cream and coffee in addition to cured meat. In 1954, a branch was added on Des Voeux Road in Central and in 1958, there was also a production facility with over 50 workers at Smithfield Road in Sai Wan. Tse Cheong was still alive as of 1968 when he attended his grandchildren’s swim meet but by the 1960s his son Tse Hing-chuen was in charge as managing director of King of Kings. Like his father, Tse Hing-chuen was an innovator and creative marketer. In the 1950s and 1960s, the HK society was still relatively poor and most people could not afford to fly so there was certain cache associated with airlines (which was why the Pan Am schoolbags was popular). Tse Hing-chuen came up with a gimmick known as the “Airline Meal” by serving his food in compartmental trays in his restaurants which was a hit. In 1962, he and his wife went on a major trip visiting a dozen cities in the US (NY, Washington DC, San Francisco etc) where they toured factories of major machinery, ice cream and hot dog manufacturers through the introduction of the US Department of Commerce and brought back over HK$100,000 worth of new machines including meat slicers, dishwashers but most prominent of which was a rotisserie chicken oven which became a main feature in his restaurant in Mongkok. 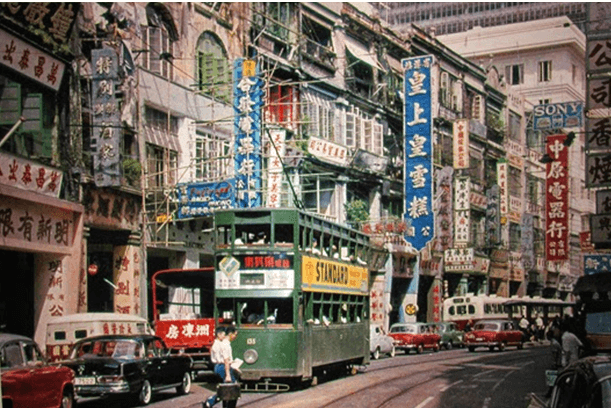 As property prices on Nathan Road soared, the Tse family re-developed the site of the Mongkok restaurant into the 17 story Rex Building (皇上皇大廈) which included residential flats, offices and retail space in 1963 and still stands today. Tse Hing-chuen and his wife Lee Lai-ngor has 5 sons and 1 daughter with daughter Tse Yin-ha (謝燕霞) being the eldest. An avid swimmer, Tse served as chairman of the Lai Tsun Swimming Society (勵進游泳會) and his children were all swimming champions. He also sent most of them to study in the US – second son Stephen Tse King-wan (謝景雲, 1947-) graduated from CSU Sacramento, third son Tse King-lam (謝景林, 1949-) graduated from UCSF with a MS in chemistry, fourth son Tse King-you (謝景柔, 1951-) graduated from Lewis & Clark college while sixth son Tse King-sing (謝景陞 or 謝景昇, 1953-) went to Harvard. In 1970, Stephen returned to join the family business. 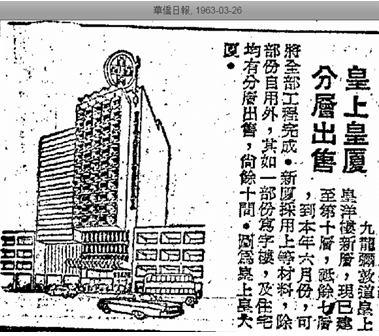 In 1972, the HK stock market was red hot and the Tse family established Kings Securities (景皇証券) with a seat at the Kowloon Stock Exchange and a retail branch at the 4th floor of the Rex Building in Mongkok opened in 1973. Stephen was later appointed director and vice chairman of the Kowloon Stock Exchange. As a company, King of Kings Co Ltd (皇上皇有限公司) was incorporated in 1963 and dissolved in 1988. As for King of Kings in Canton, that became a public private enterprise in 1956 before being fully nationalized and during the Cultural Revolution was briefly renamed “Red of Reds” (红上红) as its original name was deemed to be “imperialist”. In 1985, the King of Kings name was restored and today King of Kings Cured Food is part of the Guangzhou Food Enterprise division of the state-owned Lingnan Group. This article was first posted on 11th June 2018. Very informative article and probably one of the first mentioning KOK in details. As a side note, KOK and King of the King Group have no relationship by all means, with the latter’s founder and chairman Tse Ping-shun addressed in a magazine interview years ago that he solely “borrowed” the Chinese name of KOK for his business in early 1990s, while KOK actually went bankrupt in summer 1983 with the owners fled to the US.